Services We accomplish this by practicing both preventative and diagnostic medicine. Here's some of what we do: •Wellness clinics – full physical examination. •Vaccines – rabies, distemper, lyme, etc. •Full dental care – very important for your pet’s overall health, we even offer gum surgery! 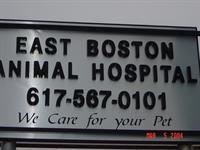 •Boarding services – Kenneling/pet boarding weekend and holiday dates are available! •General surgery – Everything from neutering to tumor removal. •X-Rays •Labs – full range of on-site tests available. •Health certificates – National and international.